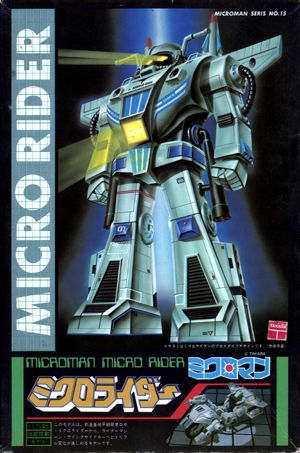 Front box art for the Micro Rider Snap Model kit. This is in the same vein as the Bio Mechanic Suit kits. You must build up the kit. It comes complete with screws and springs! The box art is beautiful, very much an 80'd design and in keeping with Japanese Mecha-type designs of the day. This piece came in a plain brown box with the lid as shown above. There was also a printed strip of cardboard that was attached across the center of the inside of the box to hold the pieces in place. The Micro Rider did not come with a figure as is generally thought. The Microman catalogs seem to indicate that it does, but this is false. The kit includes a rather large four page instruction sheet, which can be found in the Instructions section of this site. The Micro Rider itself is very interesting. It takes on the form of a heroic robot, but can be transformed into a battle ready motorcycle! You can optionally attach drag pipes or a side car with seat for an additional Microman figure! A definite plus in the eternal battle against evil!